With the threat of Alien Invasion growing ever closer & the distinct possibility that "they" are already here, it's about time we had a device to detect the humans from the human-oids. 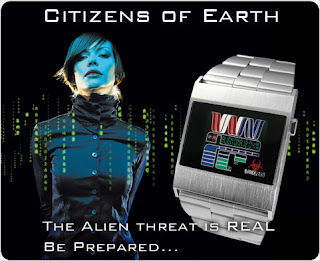 The Biohazard wrist scanner probes the immediate vicinity for Alien DNA & displays the results so that you may assess the threat level. Of course it doesn't really detect anything, but I think it's pretty cool looking, in a geek-chic kind of way. What if the aliens use something other than DNA for genes? Then you wouldn't be able to detect them at all!